These sweet ghosts are a little bit spooky, but they are sweet so it's hard to be scared! Whip some up for Halloween! 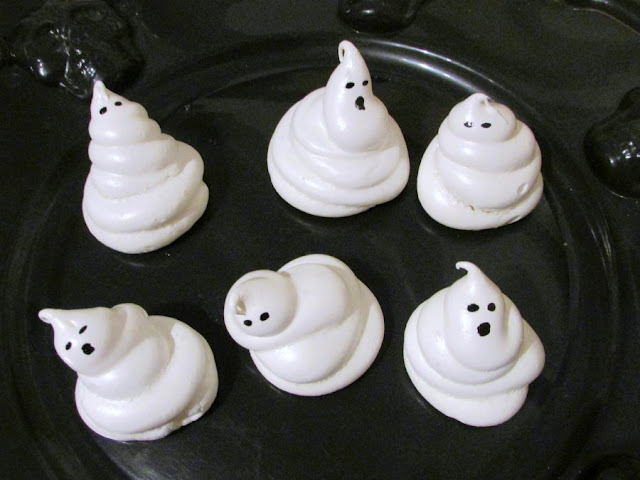 Crisp exteriors with meltaway interiors, these meringue ghosts are eerily good! They are great on their own and even better as a fun topper to your Halloween desserts. 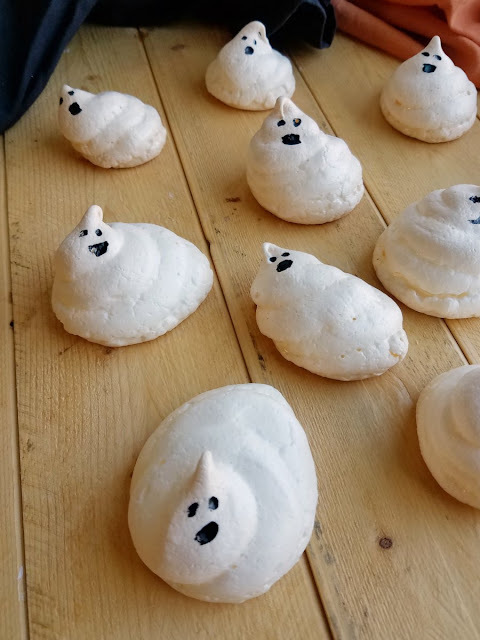 I know, I know, meringue ghosts aren't super original. But sometimes you just have to make something anyway! I needed some ghostly spirits for a dessert I am sharing soon. So, I thought I would give you a chance to gather the ingredients and maybe even give them a practice run before the big day! These little guys are fun to make. I didn't give all of my meringues a wide enough base, so a few of my ghosts decided to lay down while baking. I wasn't upset at all, I think it was cute to have some napping ghosts. As Little Dude would say, even ghosts get sleepy sleepy sometimes! The best part about this is you can give them whatever shape you would like and give them whatever character your heart desires. I think they are super cute! 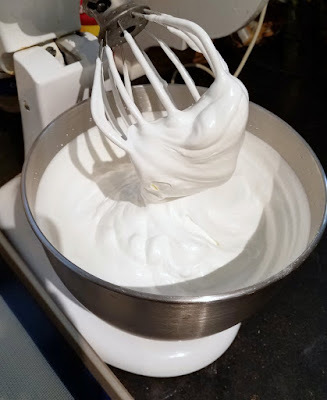 The meringue itself is super quick to make. You can separate the eggs yourself, or use some from a carton of egg whites. Either way will work. Then they take a long slow trip to the oven. You want them to dry out without browning. So it takes a bit, but no real effort. After they are crisp and delicious, all you have to do is paint on a face. We just used a toothpick and some black food gel. Little Dude thought it was fun to put the ghost's faces on. Once the food gel is dry, just store the sweet spirits in an airtight container until read to use. It is easiest to separate eggs when they are cold, so carefully separate your eggs straight out of the fridge. Then cover your bowl with the egg whites and leave on the counter until they are room temperature, about a half hour. Preheat oven to 200 F and place a sheet of parchment paper on a cookie sheet. Beat your egg whites and cream of tartar on medium until they begin to froth. While still mixing, slowly add sugar and cornstarch until completely incorporated. Turn mixer up to high and beat until you have stiff peaks, about 5 minutes. Spoon into a pastry bag with a large round tip (I used tip 2A) Pipe into swirls on the parchment lined cookie sheet. Place in oven and bake until dry, about an hour and a half. Add a little extra time if it is a humid day. Remove from oven and cool completely. Using a toothpick and black food gel, gently add faces to your ghosts and allow to dry. For more fun ideas, check out my Halloween board on Pinterest! I'm a proud momma right now. 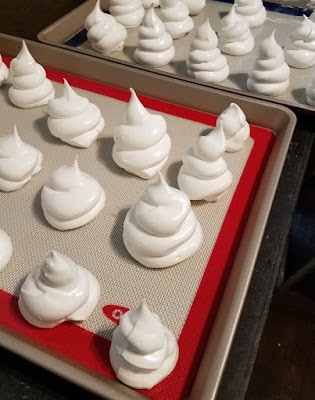 Meringues were the only thing I failed at in my foods lab in college. I probably didn't get them whipped enough. So glad you love doing this stuff. It is a lot of fun playing around in the kitchen! You could do it now, I am sure! They are so much fun to make and each one has its own personality! They were fun to make and see their little personalities come out! I can't wait for you to see the finished dessert! These are adorable. I'm actually looking for great, fun recipes to bake/make for a bake sale we are doing for the Jimmy Fund in a couple weeks. I wonder if these would hold up well to sell them! Thanks for the inspiration! Fun! They should hold up as long as they don't get smashed. They are susceptible to crushing. My little guy proved that when he just had to carry the ziploc bag full of them ;-) The Jack-o-lantern cookies we made would be great too! I'm pinning this one! So cute! Carlee I love your recipes and this is an easy and very cute idea. Thanks for sharing with us at #AnythingGoes and see you next week. Thank you so much! They were a lot of fun to make and were super cute perched on the dessert I am posting tomorrow. Thanks so much for stopping by! Kids would have a lot of fun doing this! My little guy loves to help in the kitchen! Adorable! These would be a great addition to a decked out Halloween dessert. And I've never made them, so you made me very happy to learn how! Thank you so much! They were fun to make and the ghosts in the graveyard trifle I made to go with them was fun to eat! Thanks Cathy! I can't wait to check out your new site! Thank you! They are fun to make too! Me too, I thought they turned out cute! 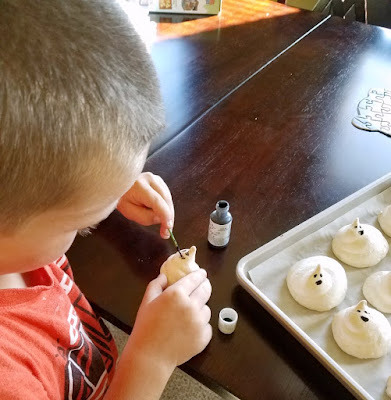 What a cute idea, can't wait to make the Meringue Ghosts with my girls. I hope you all have so much fun making them! It is fun to see their personalities come out! Thanks for hosting! These are so awesome and SO much better than Peeps. Don't get me wrong , I love peeps but I would much rather eat these. They have better shape and would look good swimming in my hot cocoa! Thanks for linking them up to Saucy Saturdays! They would be fun in hot cocoa! I will have to give that a try. thanks so much for hosting! This is so awesome :) Fabulous idea! Thank you so much for sharing, am going to try this for my daughter...but I am not sure if she would be impressed in eating "Casper"! It's hard to say how they'll react sometimes! Hopefully she thinks it's fun! Oh my gosh, these are way too much fun! Thank you for linking up at Snickerdoodle Sunday- hope to see your latest makes & makes tonight!! Thanks! I have some good ones for tonight too! I used to make these when my kids were little but ours all laid down - I like your standing up ones. We always called them Boo- meringues and thought we were terribly funny! You are terribly funny! I can't believe I didn't think of that! You guys are all comic geniuses! These a so freaking cute! I love how unique each of these are!